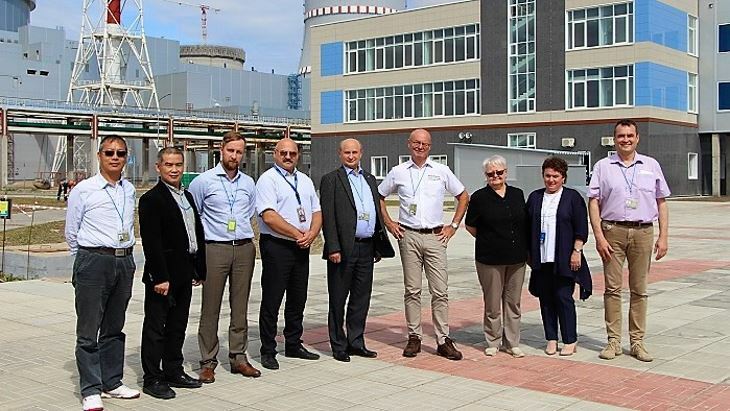 A team from the World Association of Nuclear Operators' (WANO's) Moscow Centre has completed its independent review of unit 1 of the Leningrad Phase II nuclear power plant in northwest Russia. The VVER 1200 reactor is scheduled to enter commercial operation before the end of this year. The Moscow Centre also organised a pre-operational peer review at unit 4 of the Tianwan nuclear power plant in China's Jiangsu province. The Russian-designed 1060 MWe VVER-1000 pressurised water reactor is expected to begin operating in March 2019. Rosatom, the Russian state nuclear corporation, said that over the course of this week the team had monitored the plant simulator in "various operational scenarios", analysed documentation and interviewed operations personnel. The main purpose of the visit, the fifth in a row over the past two years, was to monitor the implementation of proposals for improvements in the technological and production processes of the new nuclear power plant, Rosatom said. In December last year, WANO conducted a pre-launch peer review of the new unit, which at that time was at the physical launch stage. The team returned to the site in February to assess work on their suggested improvements. "We have seen real changes in the areas that were identified six months ago during the pre-launch peer review," said Jean-Marie Baggio, the head of the WANO team of experts. "This applies both to the good condition of the equipment and facilities of the nuclear power plant, and to the responsible attitude of the station's personnel to the equipment entrusted to them and compliance with safety requirements." He also expressed confidence that the work that was carried out within the framework of technical support missions for the power units under construction and the pre-commissioning review of the unit will continue to contribute to the improvement of operational activities at the plant, Rosatom added. The review of Tianwan 4 was carried out between 25 June and 6 July by a 12-member team from Armenia, Hungary, Japan, Russia, South Korea, Ukraine and the USA. The review team conducted in-depth interviews, made on-site observations and inspected documentation to assess the organisational management, operation, maintenance, technical support, fire protection and radiological protection measures. "The purpose of this assessment is to evaluate the preparations for all aspects of Tianwan 4 before the start-up of the project, and to identify areas for improvement and propose recommendations," China National Nuclear Corporation subsidiary Jiangsu Nuclear Power Company said today. The company said it will carefully analyse the team's findings and take corrective actions where necessary before start-up of the unit.